The Building Architect Tool (an add-on gamepack for GMax™)is part of a suite of tools including the Plug-in Manager, and an updated version of the Lot Editor, that is used to create custom content for Sim City 4. The term BAT is often used to refer both to the modelling system, as well as the model that is produced by it. 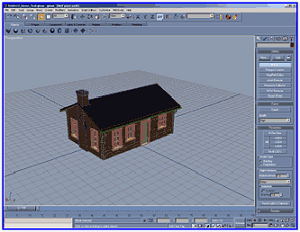 The roles of the three separate tools can be summed up as follows: The Building Architect Tool (BAT) enables you to create models in a 3D environment and export SimCity 4 Deluxe game-ready content. The Plug-in Manager enables you to create plug-ins for the game and modify the simulation properties for those plug-ins. It is with this tool that you can define a model as a house, a prop or even (but not limited to) a landmark. The Lot Editor enables you to place your new plugins on lots and get them into the game. Export - Produces a render of the model for all four viewport rotations (North, East, South, West), 5 zoom levels (zoom 6 is not rendered), and in both day and night mode (40renders in all). A dropdown menu allows the quality of the render to be selected; often a model will be exported at draft quality (the lowest of four settings) and imported into the game to check that it works in the game environment. Once it has been verified that the model is largely finished, higher quality renders will be created to check that the model's textures will fit with the game's palette. When the building is completed, it will be exported at high quality and then modded so that it will work well with the game simulator. LOD creation - The functions to create LODs for the models are grouped in the parameters section of the BAT's menu. There are 6 options available. Model Type - This function allows users to export custom foundations to fit their buildings. Night Windows - This is a feature of the BAT which allows modelers to apply textures to windows which gives the impression of lit windows during the night-time renders of the model. This control provides options which allow the modeler to control the colour and intensity of these nightlights. Preview render - Produces a quick, low quality render of the model from one particular view (i.e. zoom 3, from the north, and at night). This allows the modeler to see how the rendering process will affect the final product. It is well documented that the game's camera angle causes buildings to look shorter than they actually are, and that the rendering process changes the colouration of the textures applied to a model . As a result, it is advisable to consider stretching models along the Z-axis to correct this illusion. ↑ Gascooker. "Calibrating Photoshop for GMax". Retrieved on 2008-08-20.